Clopidogrel has largely replaced ticlopidine in clinical practice nowadays. Ticlopidine and Clopidogrel are antiplatelet drugs that are thienopyridine derivatives both differing each other in terms of carboxymethyl group. In comparison to ticlopidine, clopidogrel has a lower rate of incidence of skin, hematological, gastrointestinal tract adverse effects, and a favorable dosing schedule. These antiplatelet drugs have a short half-life. They act on adenosine diphosphate (ADP) binding sites on platelets which inhibit IIb/IIIa receptor expression responsible for binding of large vWF multimers. Clopidogrel has a lower risk of thrombotic thrombocytopenic purpura (TTP) in comparison to ticlopidine (One case in 20,000 versus one case in 1600–5000). In 1991 Page et al. reported four cases of TTP with ticlopidine use; however, no TTP was reported in 19,185 patients in Phase III trials of clopidogrel. The exact mechanism of clopidogrel-induced TTP is not unknown, but it is attributed to antibody formation. The antibodies developing after 2 weeks of therapy and has high mortality rate if left untreated. Plasma exchange therapy results in 100% cure if the therapy is initiated within 3 days of diagnosis and if left untreated fatality is high. TTP is defined as pentad of fever, anemia, thrombocytopenia with renal impairment, and neurological symptoms. The diagnosis of TTP can be made on the basis of the presence of microangiopathic anemia and thrombocytopenia without renal and neurological involvement as quite often the classical pentad is not seen in patients. We report a case of a 59-year-old male admitted with complaints of body ache and nosebleed in the emergency department of tertiary care hospital in western India. There was a history of vague fever for few days. The patient was a known case of ischemic heart disease and had undergone percutaneous transluminal coronary angioplasty in 2009, in an outside center. He was on regular medications which included clopidogrel as antiplatelet drug. The initial laboratory examination at the time of admission revealed - hemoglobin 14.0 g/dL, red blood cell (RBC) count 4.76 × 109/mm3, white blood cell count 9.88 × 103/mm3, and platelet count 20 × 109/mm3. The differential showed polymorphs - 80%, lymphocytes - 16%, eosinophils - 1%, and monocytes - 3%. Reticulocyte count was 1.2% and osmotic fragility test was normal. 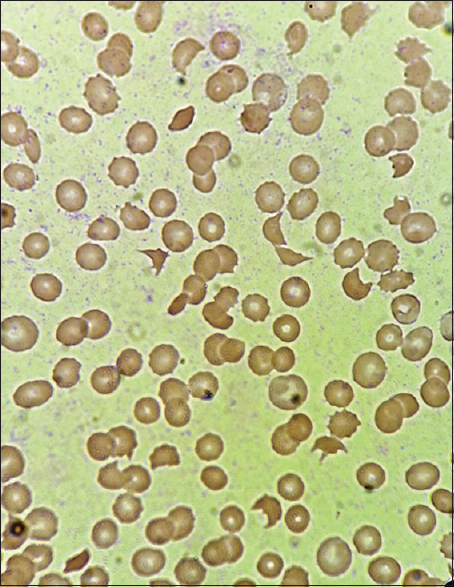 A peripheral blood smear showed schistocytes, fragmented RBCs, and occasional crenated RBCs [Figure 1]. The serum biochemistry showed blood urea - 54 mg/dl and creatinine - 2.6 mg/dl. Liver function tests were near normal - serum glutamic-oxaloacetic transaminase - 108/IU, serum glutamate-pyruvate transaminase - 30 IU/L, total bilirubin - 5.1 mg/dl, direct bilirubin - 1.1 mg/dl, total protein - 5.9 mg/dl, albumin - 3.3 mg/dl, globulin - 2.6 mg/dl, A/G ratio - 1.27, and gamma GT - 24 mg/dl. Serum electrolytes were within normal limits and HIV, HBsAg test was nonreactive. Erythrocyte sedimentation rate was 20/mm hr, prothrombin time - 15.2, INR - 1.18 activated partial thromboplastin time - 42.2 s, and serum lactate dehydrogenase (LDH) was 6031 IU/L. Test for dengue antigen was negative. The direct and indirect comb's test was negative along with ANA and rheumatoid factor which was negative. Urine examination showed the presence of hematuria – 14–16 RBC/hpf and grade + 3 proteinuria. Blood and urine culture were unremarkable. Thyroid profile was normal and serum Vitamin B12 was <159 pg/ml. Thrombocytopenia raised LDH, deranged renal function, and presence of schistocytes in peripheral blood raised suspicion of TTP. However, there was absence of any neurological signs or symptoms. Literature search revealed that clopidogrel may cause TTP on rare occasions. To confirm our diagnosis, an ADAMTS-13 assay was done which was found to be deficient, supporting the possibility of clopidogrel-induced TTP. The ADAMTS 13 activity was below <3 L (normal – 68%–163% activity) and ADAMTS 13 inhibitor was high 3.2 BEU (normal range <0.4 BEU). TTP can be caused by acquired or hereditary etiology. The acquired form as seen in this patient is caused by autoantibodies that are formed against ADAMTS-13. ADAMTS-13 a protease functions by cleavage of large multimers. The autoantibody binding to ADAMTS-13 decreases the activity of the protease enzyme which in turn allows large multimers binding to platelets forming microthrombi resulting in thrombocytopenia and microvascular occlusion. The microangiopathic hemolytic anemia component in TTP was noticed in the form of schistocytes in peripheral blood of the patient. TTP in our case occurred after 5 years of initiation of therapy whereas most of the cases of clopidogrel-associated TTP in literature are suggestive of early occurrence.,,,,,,,,,,, The exact mechanism of clopidogrel-induced TTP remains unknown. The long latent period in our case makes it a significant finding. The clinical recognition of the syndrome that characterizes clopidogrel-associated TTP is extremely crucial for the quick initiation of therapy. Our case is perhaps the only case where TTP developed after years of clopidogrel use. The case is important as it hints toward possible etiological link and it conveys information to the medical community regarding serious adverse effect of clopidogrel. Zakarija A, Bandarenko N, Pandey DK, Auerbach A, Raisch DW, Kim B, et al. Clopidogrel-associated TTP: An update of pharmacovigilance efforts conducted by independent researchers, pharmaceutical suppliers, and the food and drug administration. Stroke 2004;35:533-7. Wysowksi DK, Bacsanyi J. Blood dycrasias and hematologic reactions in ticlopidine users. JAMA 1996;276:952. Bennett CL, Kim B, Zakarija A, Bandarenko N, Pandey DK, Buffie CG, et al. Two mechanistic pathways for thienopyridine-associated thrombotic thrombocytopenic purpura: A report from the SERF-TTP research group and the RADAR project. J Am Coll Cardiol 2007;50:1138-43. Bennett CL, Davidson CJ, Raisch DW, Weinberg PD, Bennett RH, Feldman MD, et al. Thrombotic thrombocytopenic purpura associated with ticlopidine in the setting of coronary artery stents and stroke prevention. Arch Intern Med 1999;159:2524-8. Page Y, Tardy B, Zeni F, Comtet C, Terrana R, Bertrand JC, et al. Thrombotic thrombocytopenic purpura related to ticlopidine. Lancet 1991;337:774-6. Rose M, Rowe JM, Eldor A. The changing course of thrombotic thrombocytopenic purpura and modern therapy. Blood Rev 1993;7:94-103. Scully M, Hunt BJ, Benjamin S, Liesner R, Rose P, Peyvandi F, et al. Guidelines on the diagnosis and management of thrombotic thrombocytopenic purpura and other thrombotic microangiopathies. Br J Haematol 2012;158:323-35. George J, Cuker A. Acquired TTP: Clinical manifestations and diagnosis. In: Post TW, editor. UpToDate. Waltham, MA: UpTo Date; 2016. Voorhees PM. MKSAP 17-Hematology and Oncology. Philadelphia: American College of Physicians; 2015. p. 28. Rock GA. Management of thrombotic thrombocytopenic purpura. Br J Haematol 2000;109:496-507. Majhail NS, Lichtin AE. Clopidogrel and thrombotic thrombocytopenic purpura: No clear case for causality. Cleve Clin J Med 2003;70:466-70. Begue R, Dennehy PH, Peter G. Hemolytic uremic syndrome associated with streptococcus pneumoniae. N Engl J Med 1991;325:133-4. Moake JL. Thrombotic microangiopathies. N Engl J Med 2002;347:589-600. Chang JC, Shipstone A, Llenado-Lee MA. Postoperative thrombotic thrombocytopenic purpura following cardiovascular surgeries. Am J Hematol 1996;53:11-7. Evens AM, Kwaan HC, Kaufman DB, Bennett CL. TTP/HUS occurring in a simultaneous pancreas/kidney transplant recipient after clopidogrel treatment: Evidence of a nonimmunological etiology. Transplantation 2002;74:885-7. Tsai HM, Rice L, Sarode R, Chow TW, Moake JL. Antibody inhibitors to von Willebrand factor metalloproteinase and increased binding of von Willebrand factor to platelets in ticlopidine-associated thrombotic thrombocytopenic purpura. Ann Intern Med 2000;132:794-9. Methuku NK, Chandra AB, Belur A, Dabrowski L. Case of clopidogrel induced TTP recurring after four years. Blood 2010;116:4678. Available from: http://www.bloodjournal.org/content/116/21/4678. [Last accessed on 2018 Mar 07]. Wyllie BF, Garg AX, Macnab J, Rock GA, Clark WF; Members of the Canadian Apheresis Group, et al. Thrombotic thrombocytopenic purpura/haemolytic uraemic syndrome: A new index predicting response to plasma exchange. Br J Haematol 2006;132:204-9. Ong AT, McFadden EP, Regar E, de Jaegere PP, van Domburg RT, Serruys PW, et al. Late angiographic stent thrombosis (LAST) events with drug-eluting stents. J Am Coll Cardiol 2005;45:2088-92.